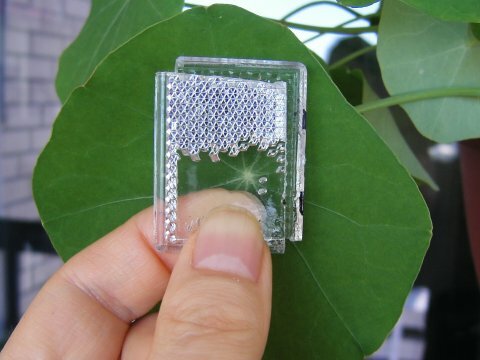 The Sun Valve is a transparent panel which also can be retroreflective. It is easy and cheap to produce. It can be used as a replacement for curtains and windows, but more important is its use to cool and heat houses, or entire cities, which would help against global warming, or cooling. The sunlight is reflected back to the sun, because the Sun Valve is now retroreflective. This is better than ordinary reflection, or white walls, because they reflect the warm light to the ground and to the clouds instead, which are then heated because of this. But with the Sun Valve, this heating is avoided, because the light is reflected back to the sun, where it came from. So the house and its surroundings get colder, because they are heated less. At night the house can cool down by opening the Sun Valve, letting the heat out, from the sun collector, and from the house. Since the surroundings are colder, there is more cooling. one does the opposite. The Sun Valve is closed at night to keep the warmth in. 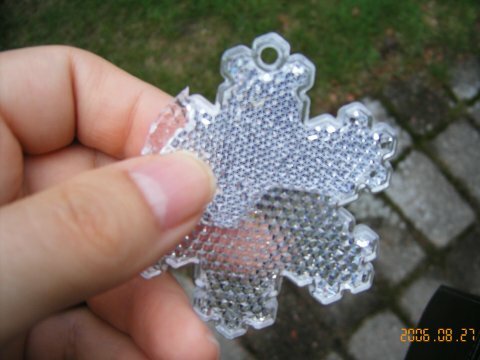 It has an isolating layer of air to retain heat, in addition to retroreflection. 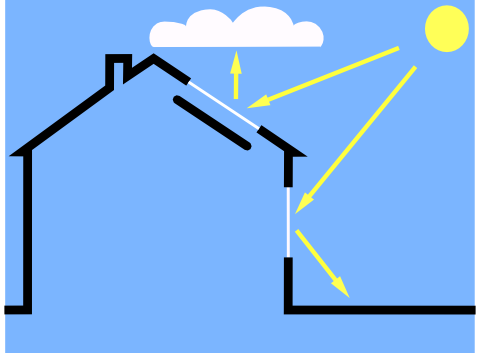 The sun starts shining, and the Sun Valve is opened to let the heat pass in through the window and the solar collector. The walls facing the sun could be entirely covered with Sun Valves over solar collectors, to cool and heat even more. Cities could also be covered, and that would help a lot. One side of each panel is covered with diagonal cubes, which do the retroreflection by internal reflection. 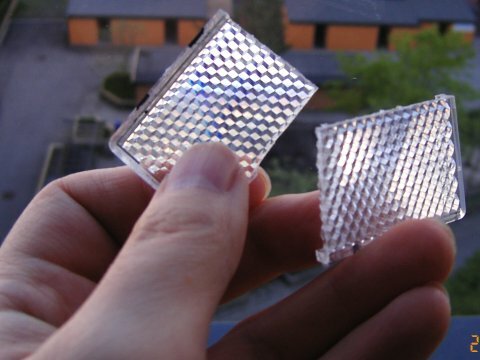 The cubes of the panels fit together, so that a thin layer of air is between them, which isolates heat, and keeps the retroreflectors working. 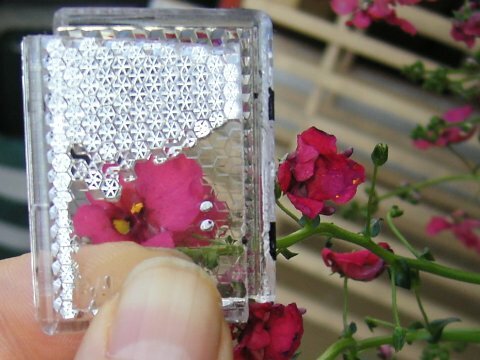 However, if transparent fluid is put between them, retroreflection is stopped, and they become transparent. So, just by pumping fluid in and out of these panels, they switch between being transparent and retroreflective. This mechanism is simple, so it is easy and cheap to produce. 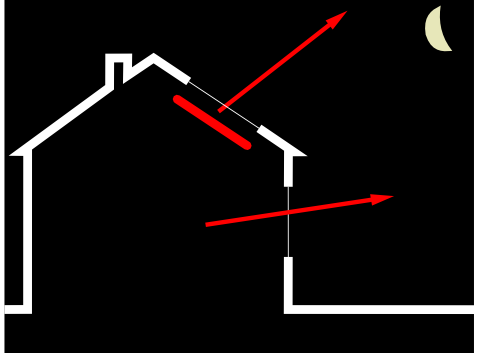 The properties of the Sun Valve can be varied by changing the materials it is made from. My prototypes are from plastic, probably polycarbonate. Water ran in and out of it quickly and faultlessly, but was not optically perfect, so water is best suited for solar collectors, and is the cheapest solution, except that some kind of alcohol better be used in winter, to avoid freezing. I achieved the best transparency by using mineral oil as the fluid, since it has an index of refraction close to the plastic. The pictures here are of this kind of Sun Valve. The smaller the gap between the panels, the more transparent it gets. By using materials with more equal index of refraction, and more precise gaps between the panels, one could achieve perfect transparency. Silicone oil flowed too slowly, and stuck to the panels, so it is not recommended. However, with properly coated panels, or the right materials, this could probably work well. The advantages of silicone oil is its high index of refraction, and that it can stand freezing cold and boiling heat without being affected. Coated panels could be even more heat retaining, and transparent. Glass is of course also a possibility. Tall panels should have (fused) spacers, to keep the panels from buckling due to pressure due to height. This could also allow low pressure gas between the panels, thus increasing heat isolation even more. Bent panels also have resistance to pressure, and might be cheaper. There are other retroreflective patterns. They can be optimized for the angle of the sun, the panels, and other factors.